I wish the graphic gave you a sense of the numbers involved, but they're in the high hundreds of billions. Wikipedia has a breakdown here. If half of that cash was going to support the sort of sustainable, healthful agriculture society claims to want, the prices of fresh, nutritious food would plummet. For all the talk of the health costs, the most economically rational purchase on earth is a Big Mac. Or possibly a 99 cent double cheeseburger. "Or possibly a 99 cent double cheeseburger." Damn, it's about time I visit the US again. Won't I get a complete meal (burger, fries and coke) at Jack-in-the-box for 99 cent anymore? You can tinker with the costs all you want, but you can't change the fact that a Big Mac tastes much better than a salad. Trying to handwave away American diet preferences is not going to work. And I have no interest in handwaving it away. But that doesn't mean we should be making the Big Mac artificially cheap, while putting no economic muscle behind more healthful choices. "you can't change the fact that a Big Mac tastes much better than a salad." If you manage the mortality-and-morbidity right, then Social Security won't need its cap lifted, but Medicare, like a sinkhole, will slowly disappear the rest of the Federal budget. That 99 cent double cheeseburger isn't a sandwich, it's a policy initiative. "But that doesn't mean we should be making the Big Mac artificially cheap, while putting no economic muscle behind more healthful choices." How are they supposed to become big and strong (especially around the hips) without their BigMacs? Thank you for pointing this out. This week I bought strawberries (2 quarts, I think), raspberries (tiny carton), and blueberries (tiny carton). Total cost of fruit: $12.00. I'm trying to add more fruit to my diet, and I love berries, but they COST. Back to bananas, I reckon. "However, if McD would offer the BigMac dip for the garden salad, this might change things a bit..."
And given the artificial flavors involved in flavoring a Big Mac, this is entirely possible. "And given the artificial flavors involved in flavoring a Big Mac, this is entirely possible." Aw, come on, don't spoil my fastfood fantasy. After all, even an artificially flavored salad would be more healthy than a BigMac (and I can't help it, imho the dip is the best part of the BM). I saw that here this past week. Last night, I had a jumbo Boca burger (from Costco) fried up in some olive oil, dijon mustard, and a good pickle. Deeee-lish! Subsidies are pretty much a smoke screen when it comes to the question the headline asks. The answer primarily comes down to labor and transportation costs plus the impacts of shelf life. A farm family, with modern equipment, can easily harvest 2,000 acres of grains yielding anywhere from 1,000 pounds (for a relatively high profit crop like dry edible beans) to 10,000 pounds (for corn) an acre. Those crops can hold their quality in storage for years if necessary and for the most part can be delivered to the consumer largely untouched by human hands. Fresh fruits and veggies, on the other hand, are still largely picked and inspected by human hands, over a six to eight week harvest. Out of season produce must com from tropic areas where continuous harvesting is possible. Perishable fruit and veggies, such as berries and leafy greens, have to be rushed to the consumer because their shelf life is measured in days instead of years. In some cases this necessitates the use of air freight, which adds more cost. Finally, the farmer's share of the price of the big mac, subsidies included, is at most 25 cents (for most of the last 15 years I would have pegged it at 10 cents, but prices are good lately). The fruit and veggie farmer probably does somewhat better with the salad, but as I said above, their cost of production is at least an order of magnitude higher. but justawriter, this is an argument for subsidizing healthy food *more* rather than for subsidizing it even less. Pouring local money into local agriculture and truck farming would do more for local economies and local health than pouring subsidies into grain bowl/dust bowl economies. 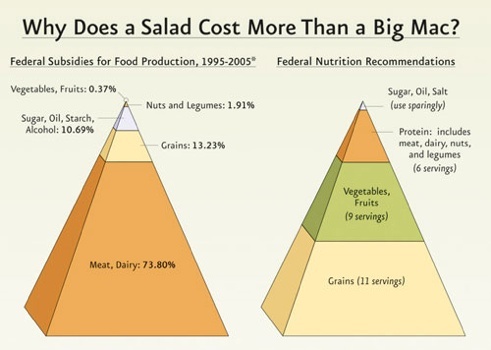 "but justawriter, this is an argument for subsidizing healthy food *more* rather than for subsidizing it even less." Not to speak of corn, rice, and bean farmers all around the world wo are priced out of the markets by subsidized Us products right now. They would love it when a cahnge of policies by the Us would finally allow them to earn their living from their soil. Big Macs are ok, but maybe you're not eating the right kind of salad. In fact, McDonalds Asian salad is pretty damn good. And what is Big Mac dip anyway? Is that referring to the Thousand Islands dressing? aimai, no offense, but there are two huge subsidy program for growing fruits and vegetables in the U.S. One is California's irrigation system and the other is the appalling wages and conditions migrant workers must endure. Turn them both off and you have local veggies grown everywhere ... at two to three times the current cost (unless we completely substitute Mexican and Chilean produce, of course). Turn off those (apparently ginormous) subsidies for meat and dairy first, then get back to me on that. Tho' I had a thought...how much of that dairy subsidy goes to stuff like WIC? And more importantly, does it do what it was supposed to do, which is (among other things) to make sure that poor kids get enough milk? Current farm policy inhibits growing of fruits and vegetables in "farm states" like Indiana, Iowa and Kansas. If farmers want to plant fruit and vegetable crops on land enrolled in USDA subsidy programs, they must permanently give up the possibility of receiving benefits on that land. Not just for the period when they are growing non-program crops. Permanently. It makes some sense to give up payments while the land is receiving subsidy payments, because other growers of fruits and vegetables are not receiving payments. But requiring a permanent withdrawal of the land from the program does not make sense. So some farm state legislators proposed that the planting restriction be lifted. And wouldn't you know, the California agribusiness lobby opposed the plan. They didn't want the competition of vine-ripened tomatoes grown in Indiana during the summer, for example. The House version of the Food and Farm Bill lifts the restrictions on a trial basis in certain areas. I'm not sure whether the Senate Ag Committee's version lifts the restrictions too. More on this subject over at Eat Local Challenge. On the subject of crop subsidies, the Congressional Research Service Report RL33037, Previewing a 2007 Farm Bill is a good source of farm subsidy numbers. "Is that referring to the Thousand Islands dressing?" Yup, I meant that Thousand-Islands-style dressing. 'Dip' is just a translation error, sry. Big Mac dip. That is a good one. McD's calls it special sauce. Mayo plus ketchup plus relish = thousand island dressing. "McD's calls it special sauce. Mayo plus ketchup plus relish = thousand island dressing." I spent a couple of years of my life making about $18,000 a year, and the disincentives to eat healthy are huge. With my current decent salary and stable lifestyle I can routinely buy and eat good food. When I was poorer and didn't have a regular schedule, it was much harder to pick and choose what kinds of food I had to eat - I had to get the maximum caloric content for the price, and sometimes just ate one huge meal (like, a pound box of pasta) in a day. It didn't affect my heath too terribly much, but then again I was young, and I walked everywhere so my metabolism stayed up. And I didn't have kids. About the most humane policy in the books is the ability to use food stamps at farmer's markets. It reinforces my love of the Mt. Pleasant, DC, farmer's market to see that people of all sorts can eat fat juicy tomatoes and delicious nectarines. That's a subsidy I can get behind. Thanks for the link Marc. It points out another reason fruit and veggie growers aren't directly subsidized (beyond water and labor). Even including field crops such as dry edible beans and potatoes, these crops only account for 3 percent of arable cropland in the United States while producing a third to a half of all gross farm income. Even a small diversion of commodity crops to these specialty crops would totally crush the market and force those producers out of business. Who would have thought that the symbols of American capitalism, McDonalds, Coca Cola, etc, are governed by plan-economics and statism? The problem with health care is not just that it is too statist (if you are a libertarian) or not provided by government directly (if you are a statist). We subsidize unhealthy products and sick-care (treatment) but not healthy foods and health care (prevention). We subsidize the worst climate polluter we know off. CO2 equivalent emissions by livestock claims the UN are worse for climate change than all care, trucks and planes combined. And now want to tax it a bit on top? What? Even Marx would protest? Livestock agriculture is directly responsible for land erosion. Cow's manure is not like the hard round droppings of native wild animals and destroys the soil. Agriculture of feed for livestock takes up to 10 times more land and water than using those calories directly ourselves. Species loss, the worst ecological problem we know off, is also triggered by livestock agriculture and not cars. Here more. I am curious to see how health care spending increases while the farm bill remains unchanged and while we introduce an emissions tax... welcome to the world of government intervention (practiced by both elephants and democrats as they have no guiding principles)! For the first time in history the economic costs of being too fat have topped the costs of being undernourished. That means that we no loger are eating to live but we are now eating to die? Speaking of breaking natural laws and behaving like gods? Who of you opposes torture? Not many I fear. There are too many who critique Mukasey while supporting the same things daily. Things that are far worse than waterboarding.. things that last a life-time. Not just a handful of victims.. but billions. Almost 30 billion in the US per year (not counting foreigners and immigrants).